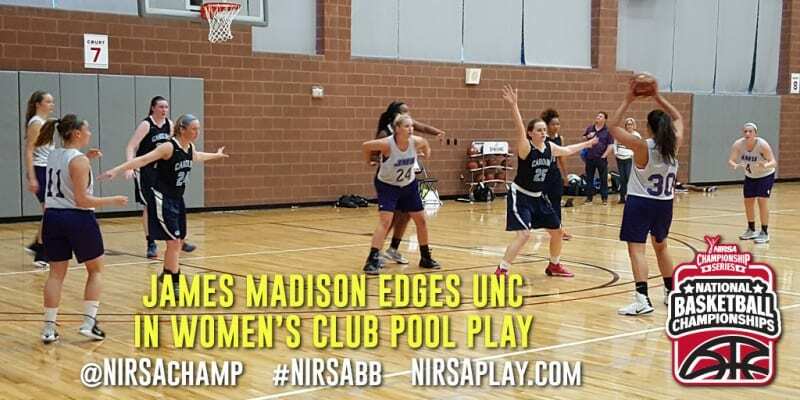 Fielding a squad of just five players, UNC battled to the very end coming up just a point short in its quest to defeat JMU in women’s club pool play action this evening. A 7-0 run in the final minutes pushed the Tar Heels to a 3-point lead, 45-42, with 49 seconds remaining. But, Mikalah Jones converted an And-1 opportunity to tie the game with 23 seconds left. After a Margot Leibl free throw put UNC up 1 with 13.7 on the clock, JMU’s Kaelin Testa drove the lane for the game-winning jumper as the Dukes defeated the Tar Heels 47-46. Kayela Buffaloe had 18 points to lead the Tar Heels. Jones had 12 points to lead JMU in the win. In other women’s club games, Georgia Tech edged Marquette 40-39 on the strength of a 15-point, 6-rebound performance by Kate Delaney. Megan McKean scored 22 points as Ohio State defeated NC State 55-34. Penn State used 18 points, including 4 three-pointers, from Mara Fitzgerald to knock off Virginia Tech 52-34.